Our Water Cooled Extruder NMR 100 is designed to process all rubber cable materials with high productivity and extrudate quality. Experience behind our thousands of deliveries ensure trouble free operation of your extruder for decades. Do you want to increase the extruder reliability and improve the process performance of your water cooled extruder? Our Water Cooled Extruder NMR 100 is designed to process thermally sensitive polymers and elastomers at low temperatures. Typical materials are semiconductive, sheathing and insulation rubbers in stripe and granular form. The barrel material is nitrided steel nitrided to the mimimum depth of 0.4 mm. The feed section has a smooth exchangeable bushing. The rubber stripe is fed with a roller. A hydraulic unit and a motor for the roller are included. An AC or a DC motor is mounted with a flange onto the gearbox body. 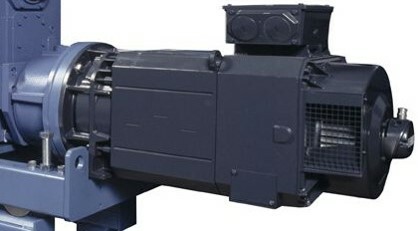 The motor is connected directly to the primary shaft of the gearbox with gear coupling. Each zone in the extruder barrel has separate temperature control. The barrel is heated by resistors moulded in cast aluminium heating elements. The pressurized, closed cooling water system includes cooling pipes and proportional valves. The cooling pipes are wound around the barrel. The cooling system is connected to the water station. Temperature in each zone is measured by thermocouples located tangentially close to the inside surface of the barrel. The thermocouple reacts quickly to changes in the process conditions providing fast feedback control for heating and cooling. To control heating and cooling each zone has a PID-controller. The feedbox has separate cooling water circulation regulated by an adjustable ball valve. Melt pressure is measured at the barrel end. The maximum allowed pressure can be preset in line control. Overpressure activates an alarm. A pressure fuse at the barrel end acts as a mechanical guard, releasing the pressure if its nominal value is exceeded. Cables between the extruder and control cabinet are included in the delivery, except the optional motor cable. Screw cooling parts with a rotating connector and hoses are included in the delivery.